The appearance of the almost untouchable Tupelov SB-2 bomber during the Sino-Japanese conflict of 1937 took the Japanese army completely by surprise. Here was a fast light bomber that was almost immune to interception by the then new Ki-27 fighters. In December of that year, the JAAF instructed Kawasaki to build a similar aircraft that had to have twin engines, a maximum speed of 300 mph, a bomb load of 400kg and to be able to operate in very cold climates (such as near the Siberian border). Design began soon after and much of what was learned in designing the Ki-45 was put into the aircraft. The use of a mid-wing allowed a full bomb bay so stores wouldn't have to be carried externally. Due to delays similar as to what was experienced by the Ki-45 (these two planes were being developed practically side by side), the first prototype didn't fly until July 1939. With the exception of severe tail flutter, the aircraft easily met all performance requirements. Raising the horizontal stabilizers and strengthening the rear fuselage took care of the flutter problems. First combat with the Ki-48 was with the 45th Sentai in China in the fall of 1940. With the outbreak of the war in the Pacific, the Ki-48 was the JAAF's most important light bomber outside the Chinese front and was operated in Burma, Malaya, and against the US in the Phillipines. It was eventually deployed to New Guinea and Netherlands East Indies. When having to go against Allied fighter opposition, it did not fare too well. It was too slow, too lightly armored, too weakly defended and had a too-small bomb load to be really effective. Some of this was rectified in an improved version, the Ki-48-II, which had improved armor and defensive armament. It also had improved engines and twice the bomb load of the Ki-48-I. Externally, the aircraft are almost identical, the only clue is the shorter carb intake of the -II. Despite these improvements, the bomb load was still too small and it was still too slow. Those not destroyed were used in taiatari suicide attacks, most of them expended during the Okinawa invasion. In 1944 a few Ki-48-IIb airframes were used as test beds for the I-GO-1 air to ground missile and for the Ne-0 Turbojet. Of the 1,977 built, none survived the war. New this kit isn't, however it still holds up very well against more modern models. According to my database, I built this kit back in February of 1984. Despite the many years, the mold is still nice a crisp. The panel lines are finely engraved and the clear bits are like crystal. 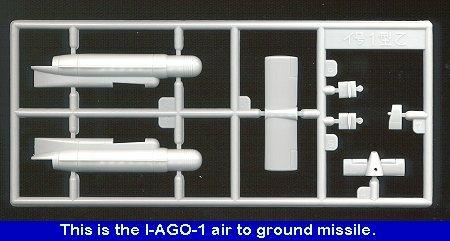 In fact, the only change is that this has a different decal sheet from that older kit and, as proclaimed on the box top, it includes an I-GO-1 missile. Now this is particularly misleading. I bought the kit as I wanted a Japanese missile carrier. I was rather dismayed to find that not only did the kit variant, a Ki-48-I, not carry the missile, but that there is no indication or hint of how to mount the missile. There are no extra bits other than the seven parts to the missile itself. The box top may as well have said 'Ki-48-I with Sidewinders' and had two missiles tossed in the bag! Well, enough grousing on this and on to the rest of the kit. Despite the crispness of the mold, over the years, some flash has crept into it, most noticeably on this kit on a few clear bits. There were also some broken parts thanks to Hasegawa's continuing insistence on putting all it's sprues in one bag. I do wish that they would spend the tiny bit extra and limit the number of sprues in one bag! As it typical with older kits, the back sides of the sprues are rife with ejector pin marks. Most are unobtrusive and will disappear when the kit is built, but others like those on the landing gear will need to be fixed. Thankfully, this aircraft has no landing gear doors so that isn't a problem! Instructions are quite adequate and give a 9 step construction sequence along with the usual Gunze color callouts. All the color names are in generic terms with no FS numbers, but not really a problem if you have access to Gunze paints. The decal sheet is very nicely doine and is done in house so all the usual warnings about using setting solution on them apply. The reds are not as bright as on older kits and since there is darn little in the way of aftermarket stuff for it, the kit decals will have to be used. You get two paint schemes for this one. First is a brown and green segmented camo scheme for a Ki-48 of the 8th Sentai. The other has a bright red tail and is in overall grey from the 75th Sentai. 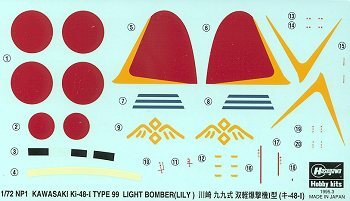 Hasegawa has provided the yellow part of the tail marking separately as well in case you want to paint on the red and not use the decal. That is much appreciated. Both aircraft are of the early variant and used in China before the outbreak of the Pacific War. This means no yellow IFF band on the leading edge of the wings. Overall a very nice old friend from Hasegawa. 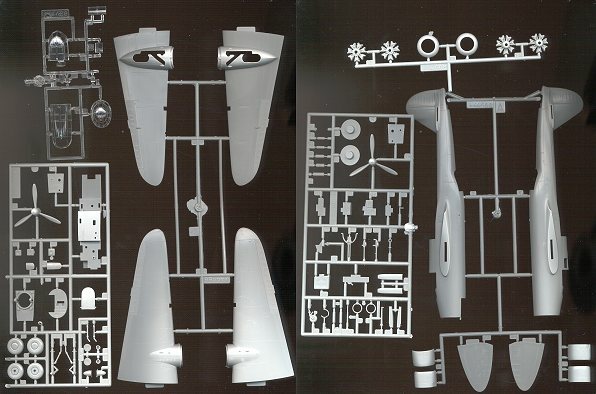 If you have any interest in the aircraft this is the only kit made, and fortunately, it is well done.